"I really like your voice! The chorus on this song is VERY catchy. This song is a throwback to the sounds of the 70s and 80s which is a very cool thing... I definitely look forward to hearing more from you. You have a lot of talent!" "Single Glance is a lyrically and musically solid mid tempo love song that is so catchy, it's almost contagious. A fun song, 'Single Glance' was produced by UK producer, Stuart Epps who has worked with renowned artists including Mick Fleetwood of Fleetwood Mac, George Harrison and Robbie Williams. Duc's breathy vocal style is reminiscent of Melody Gardot, and her vocal performance on this cut it perfect. It's pop with a definite country twist to it, and great hooks and breaks. The harmonies are well done, and it's a very well-produced track that has driving guitars and rhythms, layered with melodic keyboards. While it's about the attraction one feels from a single glance, the song itself is suitable for any occasion from hanging with friends to cruising in the car or just lifting your mood on a rainy day. Duc scores big with this track, which pop and country music lovers will adore." Single Glance was also featured in the Pop section of the Music Industry News Network site. "Australian composer Catherine Duc manages to convey a sense of accomplished artistry even before listening to her music. She's compared to brilliant artists like Royksopp, and Phillip Glass. Catherine swallows you whole with a fully realized music landscape. Itâ€™s art of the highest order." "Between burning of incenses, evaporated scents, to the search of essences of worlds always others, this is in the style of Enya, Enigma, Deep Forest or Delerium. It transmits harmony and positivity to all listeners. We recommend it." "Catherine Duc will guarantee to put your entire self at ease with her world full of joy, wonder and happiness. If this Australian artist canâ€™t relax you and make you forget about life for a minute, then I donâ€™t know who or what will." Original press releases of Visions and Dreams featured. Scanned extract of hardcopy magazine also available. Essence of Dreams selected as track of the day. "Your music is amazing. One Autumn Day and In The Light of Day are incredible." "Visions and Dreams speaks to the listener on deeply intimate levels by way of (mainly) instrumental fantasies that touch on boundaries of trip hop, ambient, world, experimental, classical and contemporary - all while maintaining a keen sense of musical integrity and pioneering edge." Front page feature about Los Angeles Music Awards, December 2006. "An amalgamation of worldwide musical rhythms and melodies that are subtly and sublimely cajoled into a contemporary ambient musical epiphany." 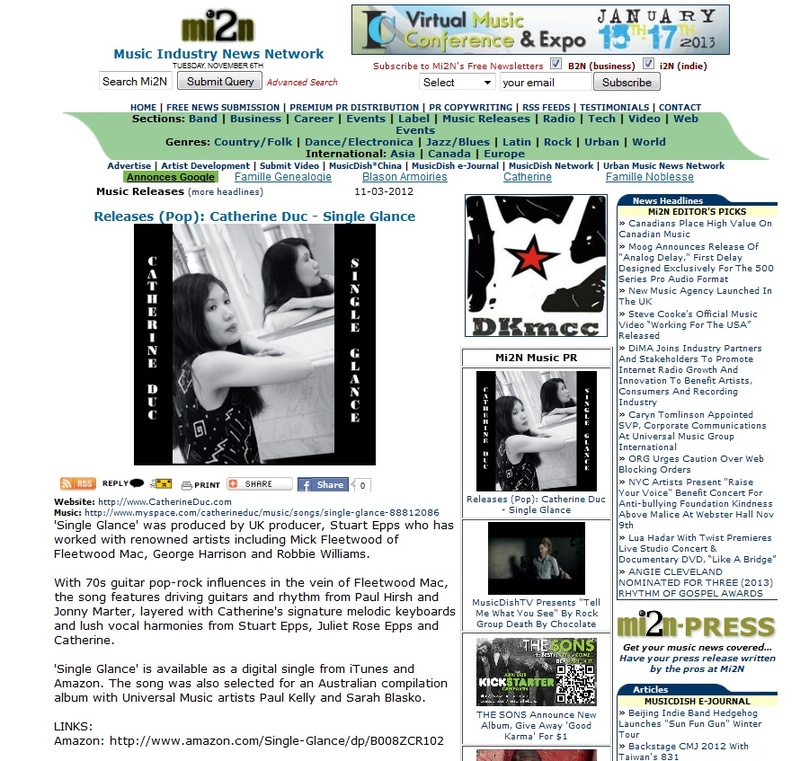 "Australian musician Catherine Duc has created an enchanting CD." "There is much for the ambient music fan here... This album gets a big thumbs up from us." Rated 'superb'. [for full review, see Prediction magazine May 2006 issue]. "It's hardly surprising that this Melbourne composer has a film degree, her ambient soundscapes could easily find their way onto a movie soundtrack: a coming-of-age tale, say, set in a mysterious foreign land, with Duc's mix of Celtic folk winds, lush synth washes, and pulsing percussion underlining a dramatic meeting of cultures." "Ah, the new world . a land of visions and dreams and softly lilting melodies . you know, it's hard to find words to describe this music as it is almost too ethereal for words. You just have to listen to it and get lost." Comments: We like her. This one (Single Glance) has a kind of Fleetwood Mac thing to it. Comments: Your new CD is really sweet. It is definitely deserving of a Grammy award. Comments: Lovely album. It reminds me of Lisa Gerrard's work. Comments: Your music is more gorgeous than ever! Comments: Your album is great! I placed it at #1 on my August Zone Music Reporter report! Comments: What an extraordinary, marvellous and wonderful CD Voyager is. Iâ€™ve been captivated by it right from the start. Comments: I processed the new album Voyager. Have you listed as a featured artist. Comments: I am in receipt of your beautiful album, Voyager, and will be adding your songs Once and The Seventh Chamber to the Heart Dance Radio Show. Comments: You have a very pretty voice, with a nice texture and an emotional connection to what you're singing. Nice atmosphere, skillful songwriting and good musicianship. Comments: Catherine Duc's Visions and Dreams is both refreshing and relaxing. Her ability to charm the cerebral senses is immediately evident in the first track of the album. Catherine's sound is surprisingly acoustic, although the music here is apparently inherently electronic. She's not afraid to sound human. Duc's music accompanies every day existence in many ways from meditation to entertaining friends. It's even great on long road trips. Comments: I am amazed at your skills as a writer and composer. Job well done. Keep up the fantastic work. I hear a lot of talent there. Comments: I absolutely love it! It is great music to have on while I am working late. Comments: Catherine Duc's Visions and Dreams is both refreshing and relaxing. Her ability to charm the cerebral senses is immediately evident in the the first track of the album. Catherine's sound is surprisingly acoustic, although the music here is apparently inherently electronic. She's not afraid to sound human. Duc's music accompanies every day existence in many ways from meditation to entertaining friends. It's even great on long road trips. Comments: I am very impressed. Comments: I listened to your CD and thoroughly enjoyed it. Comments: Your music on Visions and Dreams is glorious. Excellent writing and arranging brings out exciting emotions. Loved it. Comments: Really nice record! One Autumn Day is the early favorite amongst staff. Comments: I received your disc, played it a lot, enjoyed it, and reviewed it. Comments: From this moment we are promoting this marvellous project. Comments: Excellent work. Wonderfully smooth chill-out with lush melodies and infectious beats. Comments: Imagine Enigma exploring Celtic music and you might have an idea of Catherine's sound... a nice mix of ambient grooves, Celtic electronic and worldbeat. Comments: (World Fusion Guide Pick) Ambient music with Celtic overtones. Comments: (Review for Essence of Dreams) This theme is wonderful. Good sounds/texturing. I can hear it as music for television. It's dreamy, good job! Excellent title. Keeps you guessing. It has a metaphysical feeling to it. Comments: Haunting and uplifting at the same time, there's Gaelic elements and a hint of the Andes. The subtle mood swings always bring you back to a peaceful place. Comments: Your music/orchestrations are beautifully done. It is always a pleasure to hear music performed and recorded well. Comments: Beautiful composition. Congratulations on winning the Philips competition! Comments: I enjoyed your music, it was a pleasure to listen to. Comments: I liked what I heard and am looking forward to hearing more. Comments: You've done a superb job! Comments: Congratulations on such an excellent result. So proud of you. Good luck and I am still spinning your CD on a regular basis. I like to aim at a mellow kind of music and it fits in beautifully with that theme. Comments: Congratulations on being one of the winners of the Philips Competition. The standard of entrants was unbelievably high and so impressive. Full credit to you for being voted one of the best. Comments: Very nice indeed. Good work. Comments: The overall theme is very mellow and tranquil. The production is also very good. Comments: I just wanted to encourage you to continue producing music; I like your sound; wonderful harmonics. Keep up the good work. I will pass along your link to others. Comments: We enjoy the album. Comments: I love your music. Keep going on with good work. Comments: I got your CD... adding it into rotation next week!